"Don’t hate your body. Don’t tell yourself you’ll be happy when you lose x amount of weight or get abs or have a flat tummy. Because it doesn’t magically change your perspective of yourself." It’s 11 p.m. and Saggysara is going to sleep early, so she won’t be tired for her morning class. Suddenly an idea pops into her head. She begins typing it into a note on her iPhone. The idea came to her while looking at herself in the mirror earlier that day. Instead of picking on her insecurities, she recognises things about herself that she no longer dislikes. She assigns her boyfriend as the photographer, not that he minds: he is used to shooting for her. He photographs her flexing her abdominal muscles. After a few flexed poses, she relaxes her belly and he takes more photographs. She chooses one flexing photo she likes and another of how she looks most of the time. 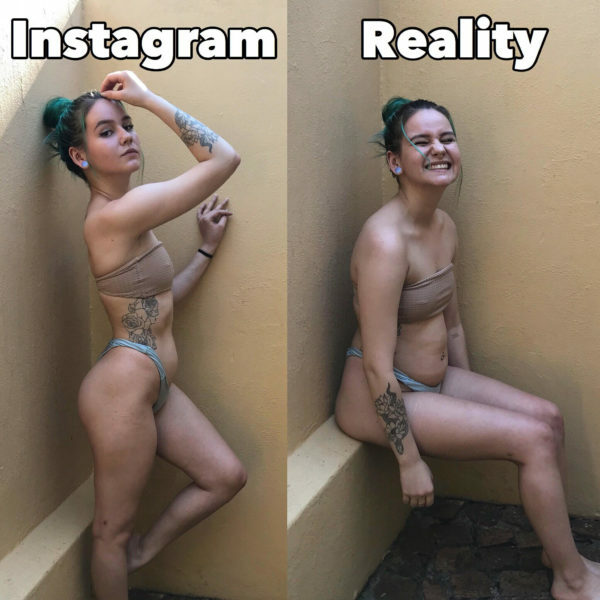 She opens her Instagram app and posts the two side by side, one titled Instagram, the other reality. Saggysara, real name Sara Puhto, is a 21-year-old Finnish student living in South Africa. She has bright turquoise hair, numerous piercings in her ears and a tattoo on her forearm of a snake amongst lotuses. She wears an equally colourful red shirt that says ‘Make America Skate Again.’ She doesn’t skate. She just thinks the saying is funny. One thing Sara does not think is funny is the way people compare themselves to models on Instagram. Even she herself was a victim of this. “I would just see all these people posed with their bodies looking amazing and I would always get jealous and feel really insecure about myself,” she explains. Checking her phone a while later, she sees her photo has over one thousand likes. In the comment section, hundreds of people message her, thanking her for her honesty. “You’re so inspiring. Thank you for all you do to help women love their bodies,” commented one followed by a heart emoji. “I just want people to realise that what we see isn’t always reality and that even though you post a good posed photo, that person doesn’t always look like that,” she says. In a survey conducted by the Royal Society for Public Health (RSPH), Instagram was rated the lowest for health and wellbeing. Users tend to have feelings of inadequacy and anxiety when spending time on the network. Sara too was overwhelmed by the number of unrealistic images of people she saw, she decided to make a difference. “I decided to start sharing more body positive images just to show people the reality behind these fitness Instagram people,” she recalls. “Even though they work out, they still do have fat and skin rolls and cellulite, all these things that people would call flaws,” she says, smiling. Her first body positive photo was posted in August 2016, where she encouraged her followers to ditch the scale. “I no longer count calories or macros and only weigh myself for progress photos and don’t let the number on the scale dictate how I feel!” She captioned. After sharing body positive photos, her following went up to 10,000. Suddenly there were articles written about her in Israel, Japan and Korea. These numbers do not matter to her. She just wants her message to be spread. “If I share these posts, maybe it’ll help at least one person to hate their body a little bit less or feel more comfortable with themselves,” she admits. Having posted for almost two years as a body positive Instagram page, she has noticed changes. “I started to realise that many people are starting to get this message of self love and body positivity,” she said. “The amount of love I got from those posts saying how much my posts had helped people…it just overwhelmed me with emotion,” she added. Instagram is changing for the better, she says. “More people are sharing more body positive images. It’s starting to normalise this and people can see that it is not just a place with perfect bodies,” she said with excitement. Many of her messages come from people who have suffered, or are still suffering from eating disorders. A post Sara made in September 2016[, she] addressed her own struggles with having an eating disorder and how she overcame it. “I thought I would be happy if I ate less, weighed less and hit my goal weight of 50kg. But the less I ate the more unhappy I got with myself…I then started eating more and stopped using apps to count calories. It was hard but I knew if I just trusted my body it would work.” She captioned a photo comparing two photographs of herself, one where she ate less than 1000 calories and another where she eats 2000-3000 calories. Posts like these have made it easier for her followers to confront their own eating disorders too. “[They] realise what they are doing is not worth it. Because no matter what they do, they will keep feeling this way about their bodies and they need to love their bodies,” she affirmed. Making posts and answering messages is time-consuming, she admits. “I could use those two or three hours to do something else, but it’s what I want to do and it’s worth it,” she says. Apart from spending time making posts and going to university, she likes to procrastinate. For her, procrastination means messing with her hair. “That’s how it went from black to green-blue over my last exam period or just randomly dyeing my armpit hair purple,” she laughs. Many of her followers wonder why she decided to call herself saggysara. “It really just started as an inside joke that I just kind of left because I am uncreative and couldn’t think of a new Instagram name,” she says with a smirk. “We would call each other saggy, because you know if high school everything is funny” she laughs. “Saggy was a very unused word we liked a lot, it ended up being my nickname that I used on my Snapchat, Instagram and on my high school hoodie as well,” she explains. Sara’s final advice do not compare yourself to others and do not put others down. “It’s like this quote I once read: ‘The presence of someone else’s beauty doesn’t mean the absence of your own,” she says adjusting her septum piercing.